To finally release an iiziRun Custom app that is branded for use with your new application and for submission to the App Store, Google Play, and the Microsoft Store, you will use the iiziRun Builder utility integrated into the iiziGo IDE. The resulting mobile app is given a custom graphical appearance to represent your software’s branding and meant to be downloaded by the consumer of your application. 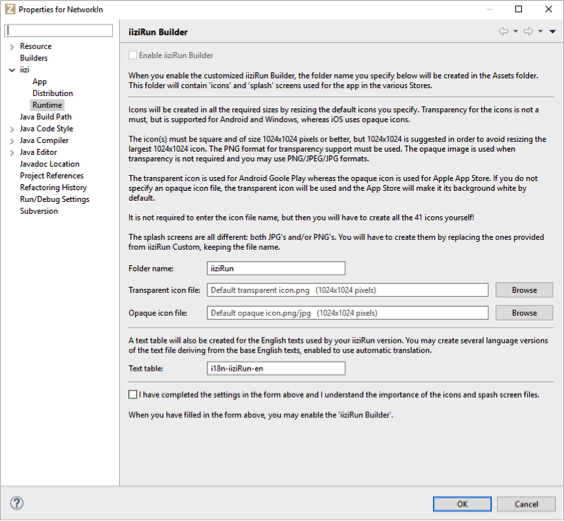 The difficult process of submitting to the App Store, Google Play and the Microsoft Store is automated for you in the iiziRun Builder workspace where you prepare the explicit build requirements for each. By right-clicking your project and choosing properties and expanding the ‘iizi’ option, you will find three further options ‘App’, ‘Distribution’ and ‘Runtime. Choose ‘Runtime’ to display the iiziRun Builder instructions and forms necessary for the creation of your iiziRun Custom app. This iiziRun Custom instance carrying your application branding will be submitted only once to each mobile app distributor i.e. the App Store, Google Play, and the Microsoft Store. All further versioning and updating of your application will be made to the iiziApp that has been deployed to your production server.